It was the Vancouver Real Estate market that initially got the party started. As prices began to climb, the contagion spread across the province. Prices across BC ignited, house lunacy resulted in multiple offers in Prince George, and double digit price gains in Chilliwack. However, Recent data released by the BC Real Estate Association suggests the province could finally be cooling. 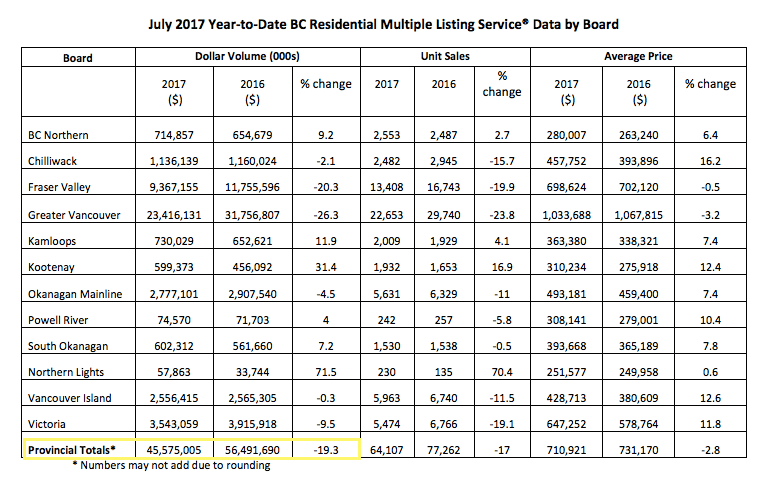 The total dollar volume, which tracks the overall dollars spent on BC Real Estate fell 19% year to date. BC homebuyers have spent a whopping $10.9 Billion less this year. Most of the declines came from Greater Vancouver, which suffered a 26.3% decline, followed by the Fraser Valley & Victoria. Total Dollar Volume in BC drops 19% Year to Date. Total unit sales fell 17% across the province year to date but remain above the ten year average. 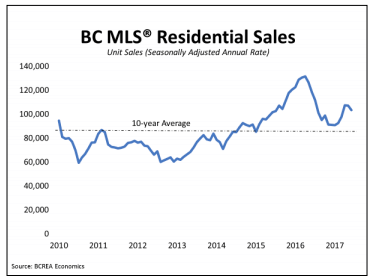 The average sales price year to date dropped 2.8% for BC. The biggest decline was felt in Greater Vancouver, where luxury home sales have ground to a halt. However, with that being said the year over year price movement haven’t changed much. 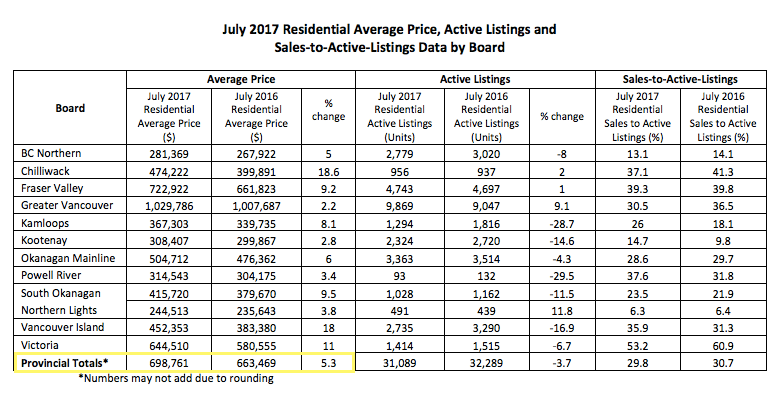 Comparing July 2016 to July 2017, the average sales price is still up 5% for BC. Either way you slice it, BC Real Estate although still red hot, has cooled noticeably. Once again Vancouver leads the charge, i’d expect it to work it’s way across the province. Get a weekly Roundup of Market News Sent to your Inbox. The views expressed are those of the author, Steve Saretsky, A Sutton West Coast Realtor, and do not necessarily reflect those of Sutton West Coast. It is provided as a general source of information only and should not be considered personal investment advice or a solicitation.